Weekend. Summer heat. Blue sky. Friends. Reggae Music. Life is sweet! And precious, we have to add, as the sweet excitement of the anticipation of tonight's concert is embittered by the Munich shootings that prevented Chronixx from performing at the Backstage Club last Friday. Now it's Saturday and we are in Hamburg, but still our hearts go out to those who lost loved ones to senseless violence, be it in Munich, Brussels, Nice, Paris, Orlando, Baton Rouge, Islamabad, Garissa or Kabul. In an emotionally dense evening, around 550 people gathered at the Fabrik to enjoy the unifying power of music. 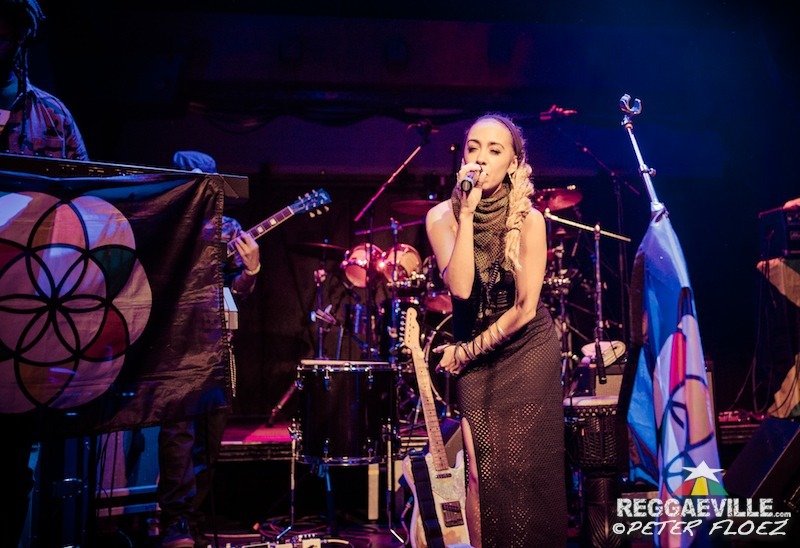 Before we get to see superstar Chronixx, however, we are exposed to an exceptional talent from Australia: Nattali Rize! Her band (Steven Maxwell on keys, Sparrow on bass, Yello on drums and One Rebel on guitar) enters stage around 9:30 pm, and without much ado or announcement, they start. The eerie sound of a siren echoes through the venue, and after a short intro during which I realize that Sparrow wears a shiny helmet, Nattali's angelic voice fills the place. Despite her petite-ness, she rocks the stage and holds the audience in a firm grip, singing about the New Era which is about to come, that we are One People and how we need a Heart Of A Lion, the latter a shout-out to those who build up and take care of the communities they live in. A show she a show! Even while moving around, she hits every note and then picks up a guitar to accompany herself in Mountain, skanking with her band. Special mention deserves a speech she prepared and delivers – in German! "Vergiss niemals, wir sind eine Menschheit und weder Mann, Frau noch Kind sind illegal. Wir sind die Pioniere des Paradigmenwechsels und Schöpfer einer neuen Welt!" (Never forget, we are one human family and no one, man or woman or child, is illegal. We are the pioneers of a paradigm change and creators of a new world!). Frenetically cheered, Nattali ends her energetic show with the oriental sounds of Rebel Love, not without having won dozens of hearts and new fans. During changeover, Crucial B is on the turntables once more, keeping spirits high with his usual proper selection. A few minutes before 11 pm, Chronixx ambles casually on stage, a cup of tea in hand. He is backed by his very own Zinc Fence Redemption band, a fine group of top-a-top musicians that consists of Elisha Ellis (drums), Joshua Jones (bass), Stephen Coore (rhythm guitar), N'Nandi Robinson (Lead Guitar), Evan Mason (keyboard, well, actually 4 of them!) and Hector Lewis (percussions). The latter is thanklessly placed in a dark corner of the stage, but his performance is an eye-catcher nevertheless, especially since the lead singer obviously needs the first five songs (Start A Fyah, Roots And Chalice, Ain't No Giving In, They Don't Know and Majesty) to warm up both his voice and to the crowd. When he comes to Smile Jamaica, however, the irresistible enthusiasm of the audience which sings along full-throated cracks his shell and brings out the sweet smile and movement we came to see. The subsequent Capture Land has a wonderful dub-sequence during which the whole band interacts (again, Hector is a special side show to watch), and both Ghetto People and Spanish Town get huge forwards. "We rock it for the Munich posse, we rock it for the Hamburg posse…" freestyles the singer on this wonderful riddim, and while Elisha and Hector have long since succumbed to the heat and taken off their shirts, Chronixx still wears a zipped-up long-sleeve. Of course, Who Knows and Here Comes Touble make the massive go wild, but it's a wicked dub-steppy version of Blaze Up The Fyah that has everyone jumping along with the artist. Party is on! And when Chronixx teases the crowd with the words "Normally I would go off stage and you would say…", they promptly answer: "We want more!" And more we get. The fantastic News Carrying Dread swims into a medley of Inner Circle's Sweat (how fitting!) and the original Tenement Yard song. The following track, introduced as "Acapella style", is a complete freestyle improvisation, as manager Tiago tells me later, but through the professionalism of the band it seems like a normal part of the set. Invited to the Dancehall during Warrior, a bold young man by the name of Adamski joins the artist on stage for some moves. 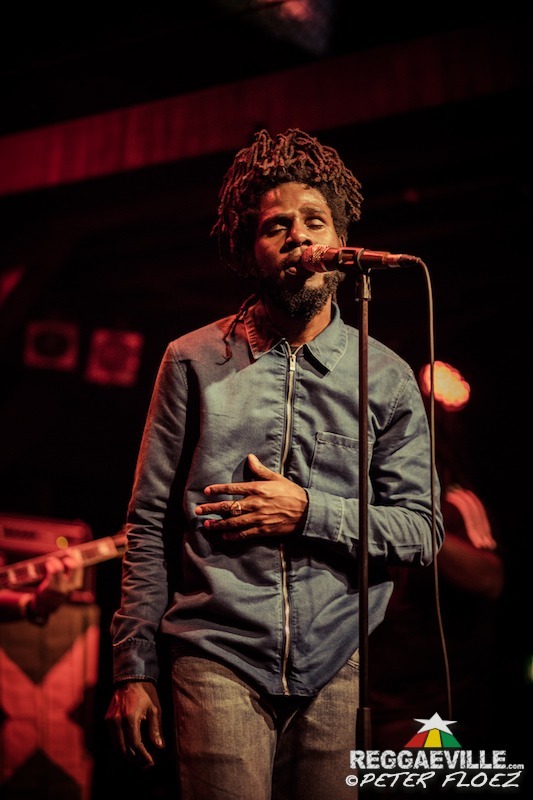 With the last song, Chronixx introduces the members of his band as well as sound engineer Claude Reynolds, sends final greetings to the Hamburgers and retreats. He leaves us breathless and happy – no doubt this evening will serve as a welcome memory that helps us go through times of hardship such as these. Thank you, Chronixx, Zinc Fence Redemption, Nattali Rize and Revelation Concerts for this vibeful night!! !